Here’s a wild project I recently completed – Belt-Fed Baby! 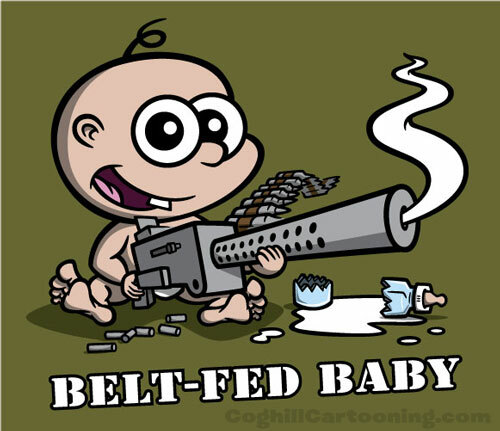 The client was the owner of a gun shop, and he always used the pun of referring to himself as a “belt-fed baby” (as opposed to a “bottle-fed baby”), playing on the belt-fed aspect of machine guns. I loved the juxtaposition of the cute baby and the giant machine gun, although I am sure there are some out there who will be up in arms over the design.